Some progress but now back to square one. 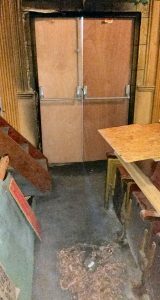 The stage Curtains have been taken down and are away for cleaning – well actually they have already been cleaned. But they cannot be re-installed until the theatre is cleaned. The smashed plate glass window in the foyer has been replaced. The electricians have done emergency make-safe work but cannot do the re-wiring until the theatre has been cleaned. The stage door has been replaced, and the fire doors also. There is more work to be done on these – but already the theatre looks more cheerful without its dreadful wound. But the latest news from the insurance loss adjuster is that the theatre cleaning company want to make an appointment to do a second survey, this time in the company of a scaffolding contractor. This really is back to square one.